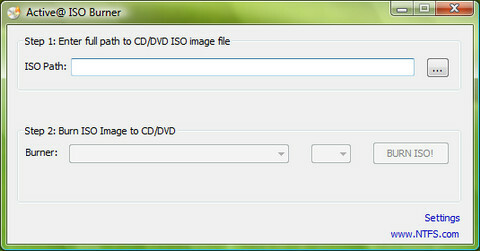 The ISO Image file contains all of the folder and/or file structure for the CD Disk in a compressed form. Whatever software package that you use to burn the image needs to be able to read an ISO Image File and translate it so that it can understand the folder and file structure (and the files themselves), break them out and them burn it to a CD. A simply handy utility for this purpose is Active ISO burner. Insert a blank CD in your CD-RW drive, Type the path to ISO image file or click Browse button to locate it via standard File Open dialog. Click the [BURN ISO!] button to start the process of writing ISO image to CD.